Join the discussion on our forums! Come discuss Sergeant Sally over in our dedicated Sergeant Sally discussion topic. Deathrattle: Deal damage equal to this minion's Attack to all enemy minions. This + Bonemare on turn 10 in a Handbuff pally deck is yummy board clear. This card seems much more powerful with Spiritsinger Umbra. But probably still not good enough to play in constructed. 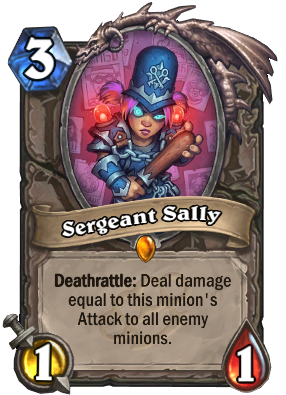 The problem with this is, even if you manage to buff her, the opponent will simply trade away his/her minions before killing Sergeant Sally, which is why the only combo that works is Power Overwhelming, which is rotating out of Standard soon. If only this card had Taunt or Charge. I think that's all it needs to be viable, without being too op (Charge might be op though). This card's effect really needed to be a battlecry. There was no card with deathrattle AOE that was good in the history of hearthstone and this card doesn't even have taunt. Face decks just hit face so it doesn't save you from any damage and others just trade with some of your minions so that it AOE would be much favorable for them since explosion goes off on their turn. If this card was good grimy goon decks would be in so much better spot right now. Chillmaw was a good deathrattle AOE only due to his taunt. Why is this not used by Warlocks or Rogue decks? Warlocks: Power Overwhelming // Already used your Shadowflame? Am I being over dramatic or am I right? I've been using her in Renolock and she's only okay. I do love the card and have gotten to see many Sally + PO clears (really encourages Dark Peddler into second PO as well), but there are too many cards that would better serve the deck. The mana cost is just a bit too high considering how often you get no value. A bit like Gormok. It's marginally good but hard to justify if you're trying to be competitive. I think you are right man! I feel like this would've been better as the Paladin Legendary with Wickerflame's effect and Wickerflame with her effect. A guy with a cannon for a chest exploding and damaging stuff on death? Nah, Divine Shield and Taunt. Heck Paladins representing the Police would've been a cool idea. 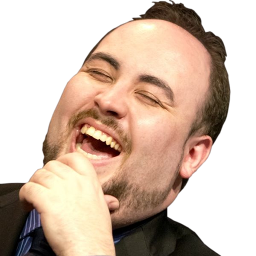 lol you should've applied for the game designer job they posted a couple of weeks ago. I regret crafting this card. It's slow in grimy goons decks. True, the power overwhelming combo is very good, and Renolock is still powerful at the moment, but this card isn't versatile.